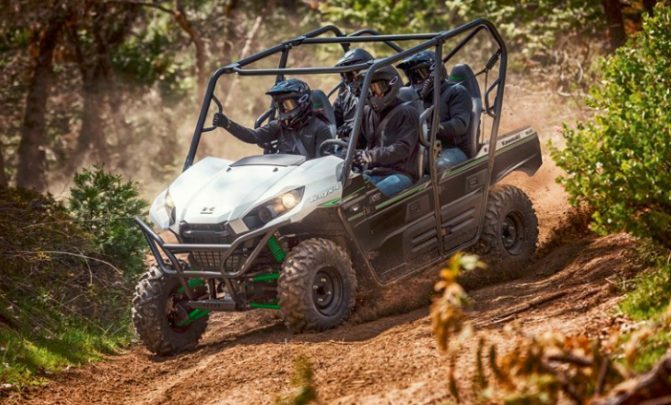 As UTVs continue to take over market share from traditional ATVs in the off-road world, it’s easy to forget that not everybody knows exactly what a UTV is or is familiar with the terminology. So what is a UTV? I’m glad you asked. If you ask ‘What is a UTV?’ the best place to start is what those three letters mean. There is actually a little bit of disagreement when it comes to what UTV stands for. I’ve always been firmly in the “Utility Terrain Vehicle” camp, since ATV stands for “All Terrain Vehicle,” it just seemed like a natural fit. Others use “Utility Task Vehicle” or simply “Utility Vehicle.” Ultimately, all three are acceptable (but I’m definitely right). Further muddying the waters are people who simply use individual model names to refer to UTVs as a whole. This could include RZR and Ranger (Polaris), Rhino (Yamaha), Mule (Kawasaki), Gator (John Deere), along with many others. 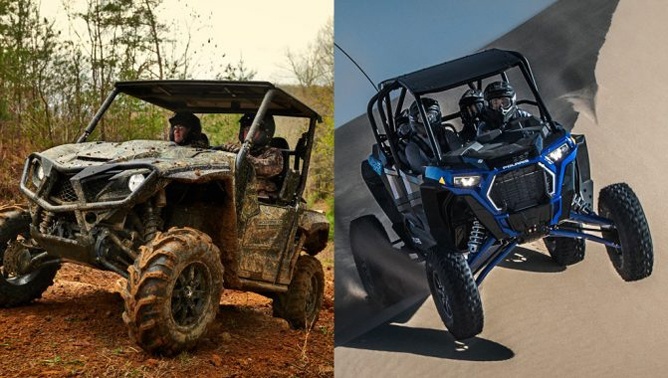 Take a look at one of the manufacturers’ websites and you may see dozens of different UTV models. However, you can generally break them down into three categories: Sport, Utility or Sport-Utility. 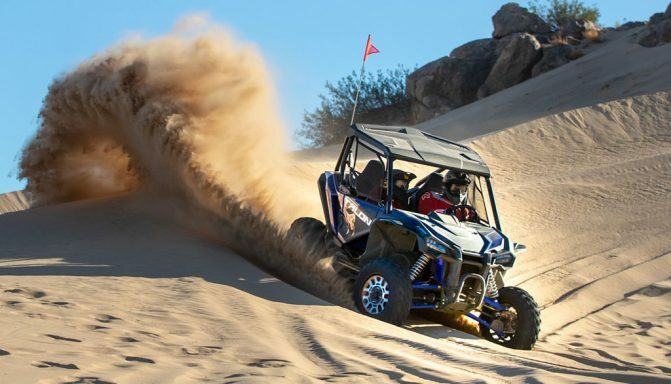 Sport UTVs are typically designed for fun (think high-speed trails, sand dunes and racing). Utility UTVs are ready to work and are often found on farms or job sites. Finally, Sport-Utility UTVs bridge the gap between Sport and Utility. While they aren’t meant for racing, they can put a smile on your face on the trails, tow a trailer, help out on the property, or haul a deer out the woods after a successful hunting trip. 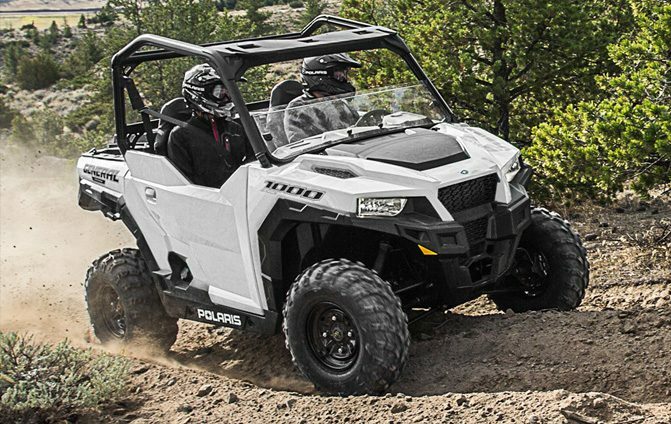 At this point, all of the major ATV manufacturers, with the exception of Suzuki, currently produce UTVs as well. Let’s go brand by brand so you know who makes what and what it is intended for. Who makes the best Side by Side UTV? Shortly after most people ask ‘What is a UTV?’ they want to know who makes the best one. This is a question that has led to some very heated arguments among off-road enthusiasts. Polaris loyalists will argue with Can-Am fans, Yamaha people will trade shots with Honda faithful. Ultimately, the only correct answer is the one that you like the best. If you are in the market for a UTV, consider carefully what you need it for. While a Sport UTV is great fun, it’s not going to be terribly useful if you need something to help you haul gear across your property. Conversely, a Utility UTV isn’t nearly as much fun in the trails. 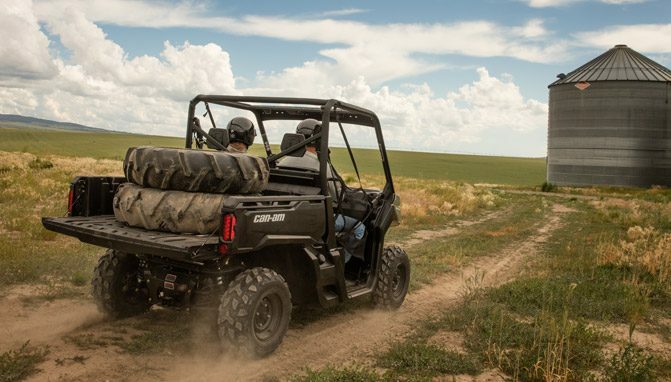 The best UTV is the one that fits your budget and your needs. As all of the major manufacturers are making good machines these days, a smart buyer would base his decision on the dealer. Ideally, you’ll have one within a reasonable drive from your house so it can be easily brought in for service. But most importantly, you need to trust the person selling you your UTV. If you don’t, you’d be better off choosing a different brand and going with a dealer that you consider trustworthy. Armed with a little more knowledge after asking ‘What is a UTV?’ you may be wondering if an ATV or UTV is right for you. There are a few factors to consider, but it’s really not a very difficult decision to make. First, ATVs are generally less expensive. So if your budget is limited but you still want to get out and ride, an ATV is a great way to get started. The second consideration is how many people will be using it? If it’s just you, then an ATV is a solid choice. But if you want to bring somebody else along for the ride, a UTV is a better fit. 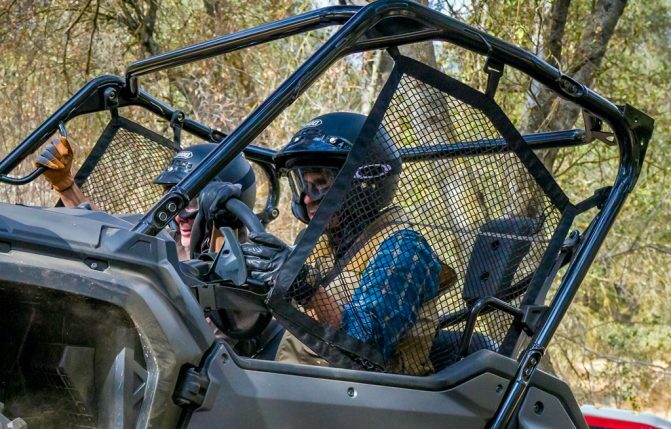 ATVs are almost always designed for just one person. There are two-up models you can use for a rider and passenger, but it is not recommended to carry a passenger on a single-seat ATV. ATVs and UTVs can both be fun and useful machines. The right one for you depends on what you need it for. The final choice is what you plan to use the vehicle for. A Utility ATV is fun for both trail riding and getting some work done, but it doesn’t have the capacity of a UTV. 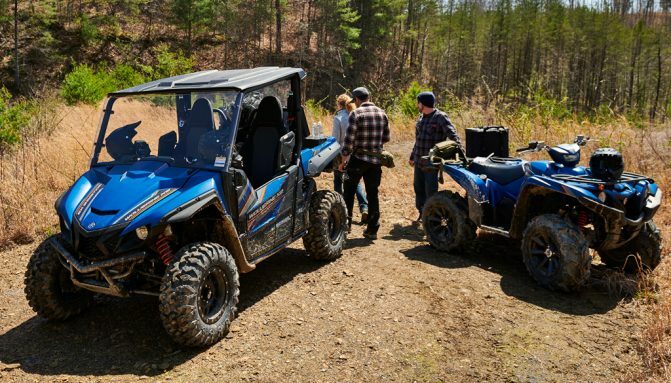 You can still haul a trailer, push a plow and carry some weight on the racks of an ATV, but a UTV has a bed that can carry up to 1,000 pounds and seat as many as six people (depending on the model) and tow more weight. Do I need to wear a helmet in a UTV? Always wear a helmet when you go for a drive in our UTV. There is a disturbingly common misconception that because a UTV has a ROPS (Roll Over Protective Structure), you don’t need to wear a helmet. I can’t stress enough how wrong this is. If you do happen to roll over your UTV or just come to a sudden and violent stop, a helmet could save you serious injury or worse. You’ve only got one head – you’d be wise to protect it. On that same note, you should definitely wear the provided seat belt in the UTV. Those are there to protect you in case of a violent stop or rollover and not wearing one puts you at serious risk of injury.